Mission: To help answer questions about the Bible as it relates to science and earth history and vice versa. If the God of the Bible created the world we live in, then the Bible and our scientific findings should be in perfect agreement. Such is the premise of this website. While we cannot know all the answers, we will here seek to bridge the often troubling gap between the Bible and geology. Why? Because today there is a perceived wall between some Christians and scientists, both of whom feel the other side is blinded to the truth in the data before them. Another potentially more dangerous wall exists within the Christian community itself. It separates sincere Christ-loving people who heatedly debate things such as the age of the earth and the geographical extent of Noah's Flood. It is my goal to provide information to help answer some of these questions, clear up any misconceptions and start tearing down the dividing walls. The material on this site will hopefully be useful for the practicing scientist, the theologian and the layperson. There are many other websites and organizations that touch on these subjects, but I have found that many only scratch the surface of God's Word, and most do not have an adequate understanding of geology in order to accurately compare the two. All information on this site is free for reproduction, distribution and use (unless specifically noted) as long as the site is referenced. **This site will constantly be updated. Please check back periodically for more information and resources. 1.) Creation: What is the length of the Creation "Day"? Can everything in Creation be categorized into the Creation Days? Do Genesis 1 and 2 contradict each other? Can we reconstruct the physical world in the time of Adam and Eve? What did God mean when He pronounced His creation "very good" in Genesis 1:31? Exegetical commentary on the biblical Creation account (Genesis 1-2) (PDF). 2.) The Fall/Curse: Is all of Creation cursed? Was there pain and death before the Fall? Are there consequences of the Fall still today? Are natural events like volcanoes and earthquakes the result of the Curse? Exegetical commentary on the biblical account of the Fall/Curse (Genesis 3) (PDF). 3.) The Flood: What was the geographical extent of Noah's Flood? What was the purpose of the Flood? Can a year-long global deluge really account for all of the fossil-bearing rocks and most of the geological formations around the planet? Where does the Flood fit in relation to the geologic column? Exegetical commentary on the biblical account of the Flood (Genesis 6-8) (PDF). 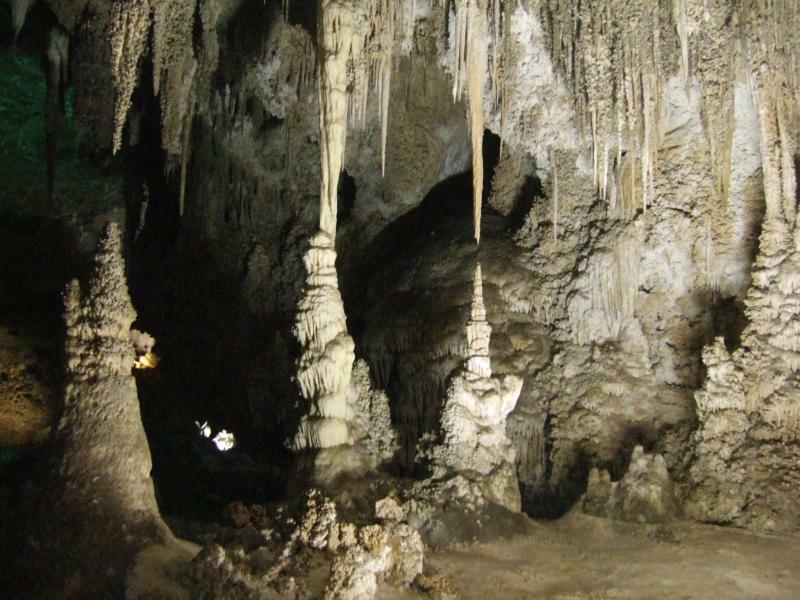 Carlsbad Caverns in southeastern New Mexico. Was this formation caused by the Flood in Noah's day? 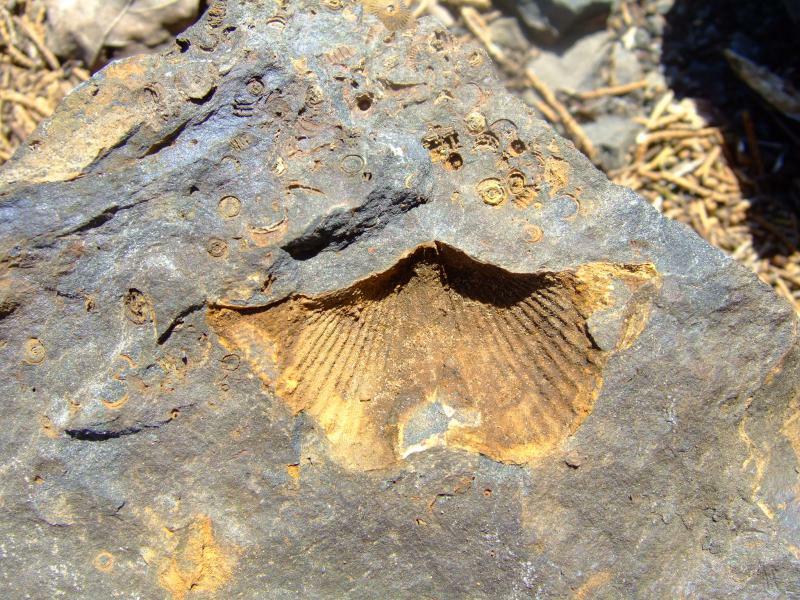 Were the fossils in these rocks the result of Adam's sin in the Garden of Eden? Many people would say yes and go against the grain of mainstream geology. Does the Bible truly teach this? We will explore this and other biblical geology questions on this site (photo by author). The disagreement stems from one’s opinion of just how much these three events affected the natural world we live in, and thus it is a “Matter of Extents”. Within the Christian community there are Young-Earth Creationists (abbreviated YECs throughout this site) and Old-Earth Creationists (abbreviated OECs throughout this site). Most YECs believe in a Global Extent with regards to these events. That is, the Flood was Earth-covering, all Creation is cursed, and the Days in the Creation account include everything that exists. Most OECs adhere to local extents such as, a local Flood; a localized Curse that did not affect the whole Creation; and a Creation account that was intended only to give a brief list of relevant created things. Based on how one feels as to the extents of these events, arguments undoubtedly arise as to the age of the earth, the history of the physical laws of nature and the reliability of the geologic record. My goal on this site is to let the biblical text speak for itself when it directly and indirectly addresses these issues in order to hopefully arrive at an answer. Along the way I hope to clear up a few misconceptions that have crept in, such as belief in an old earth is synonymous with a belief in biological evolution, and that the earth merely has an "appearance of age". We will also see if there are any theological implications in adhering to an old-earth versus a young-earth view. To help you out with your beliefs regarding these events, I have prepared a Bible & Science Test with 35 questions relevant to the discussions on this site. I have placed my answers in the About Me page so that no one is unclear as to my views. In addition, I offer exegetical commentaries on most of the science-related passages in the Bible. The other passages outside of Genesis will be helpful in our understanding of the early chapters of the Bible. Codex Sinaiticus: The oldest virtually complete Bible available today, dating from the 4th century AD. This image shows Galatians 5:10 to Ephesians 1:9. 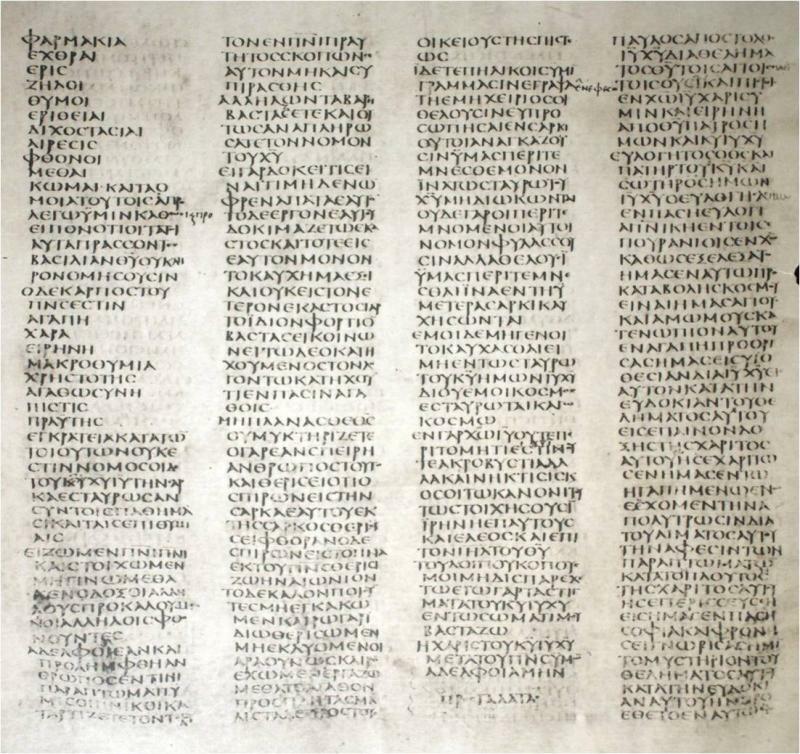 Note the "Fruit of the Spirit" are written on separate lines in the first column as opposed to the standard 12 letters per line (image courtesy of the Center for the Study of New Testament Manuscripts (CSNTM)). Perhaps you’re wondering why we even try to harmonize the Bible with geologic and other scientific observations. After all, wasn’t the Bible just written by a bunch of shepherds and nomads a couple of thousand years ago and is full of myths about origins and floods? Well, the Bible says of itself that it is theopneustos (a Greek word that literally means 'God-breathed' (2Tim. 3:16)). If there is a God, and this self declaration is true, then there must absolutely be a 100% agreement between the Bible and our scientific observations. That’s not to say that the Bible is an all-inclusive science textbook, but there can be no contradiction between the two. If there are contradictions, then it must be a result of an interpretation. To be sure, there are scientific interpretations and biblical interpretations. Human beings make them both so, as a result, both have the possibility of error. We must be honest in saying that the Bible NEVER claims the earth is only 6,000 years old. We also must be honest in saying the Bible NEVER claims that all of the geological formations were laid down during Noah's Flood. Many people hold those views, but it is important to realize that those are interpretations based on reading the text. This site attempts to challenge all views to see which are validated by the biblical and geologic data. If you are unsure of just what is in the Bible or what it’s all about…or if you just want a refresher, please check out my Chronological Walk Through the Bible and the ﻿timeline version of that walkthrough﻿. Unlike other walk-throughs, this generally puts the events of the Bible in order as they unfold historically. This is a good way to understand the biblical accounts in context and can be very effective in grasping the big picture of Scripture. 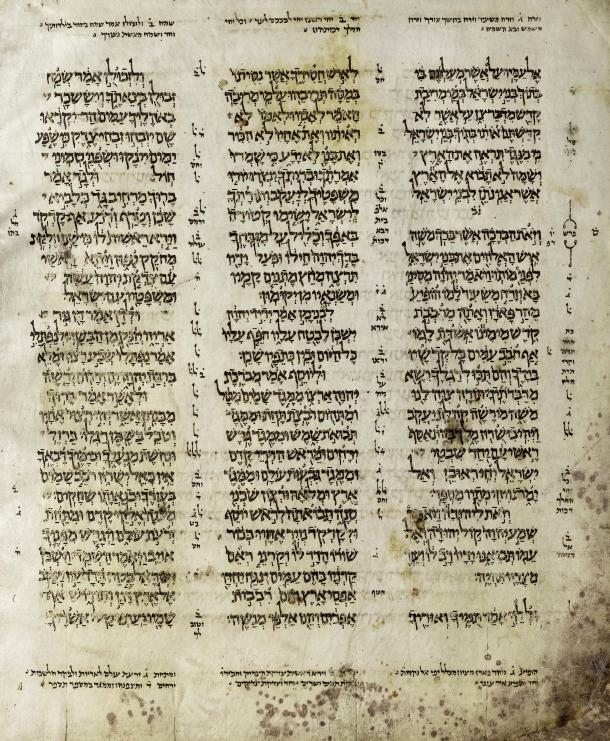 Passage in Deuteronomy in the Aleppo Codex (10th Century AD). Before the discovery of the Dead Sea scrolls, this was one of the earliest Hebrew Old Testament manuscripts (image from Wikipedia). Also, it will be important to remember that the Bible was not written in English. The Old Testament was written in ancient Hebrew, and some parts were written in Aramaic. The New Testament was written in the common world language of 2000 years ago which was koine Greek. The English translation of the Bible is a very interesting study in itself but is beyond our scope here. We are in a time where new English versions appear almost annually so it’s important to understand which are the good ones, which cater to special interests, and which are just paraphrases that sometimes lose the original wording. I have done an English Version Comparison of some of the New Testament translations and have found that the New American Standard (NASB), New King James (NKJV) and English Standard Versions (ESV) appear to be the best 21st Century renderings of the original language into English. For text-critical reasons, I prefer the NASB and ESV over the NKJV and will use them frequently on this site. The original texts I will use are the Nestle-Aland 27th edition (NA27) for the New Testament and the Biblia Hebraica Stuttgartensia (BHS) and Septuagint (LXX) for the Old Testament. The Lexicons used here are the Theological Wordbook of the Old Testament (TWOT) and Brown-Driver-Briggs (BDB) for the Old Testament and the Theological Dictionary of the New Testament (TDNT) for the New Testament. For much more information and resources regarding the Bible, please see the Bible and the References&Resources pages on this site. While the Bible was and is not meant to be a science textbook, it certainly does contain a wealth of information on the subject. Please see the Creation/Science Passages page for a list of relevant passages in Scripture along with the exegetical commentaries. It is crucial to understand that we must read the passage in context and make observations before we can properly interpret the passage. Much the same way as in science, faulty and contradictory interpretations of Scripture are often achieved by skipping or rushing through this observation phase of reading and analyzing the text. The exegetical commentaries on this site spend a great deal of time in this very important step. Only after this is done can we hope to truly understand what God's Word says about scientific interests and, in particular, the field of geology. Geology is informally called the "study of the earth". It is derived from the Greek words ge (earth) and logos (logic or reason). The geologist therefore is to apply logic and reason in his or her attempt to figure out how the earth works. A geologist may study many various branches within the science including economic geology (mining or oil and gas exploration), engineering geology (determining the stability of the earth at construction sites), environmental geology (assessing the damage of and remediating hazardous spills) and others. Regardless of the discipline they choose to follow, the professional geologist is basically trained the same in their early schooling. All must take courses on physical geology (introductory concepts), historical geology (how the earth has changed over time), structural geology (how rocks deform and mountains are built), sedimentary geology/stratigraphy (how rocks were deposited in various environments), mineralogy (what rocks are made of), petrology (how different rocks are formed) and paleontology (study of ancient life and the fossil record). These introductory courses give the geology student a background with which to take into their more specialized training. Throughout their training, the student is instructed to always apply the scientific method to their research. That basically follows this order: observation, develop multiple working hypotheses, test the hypotheses, come up with the best interpretation of the data. 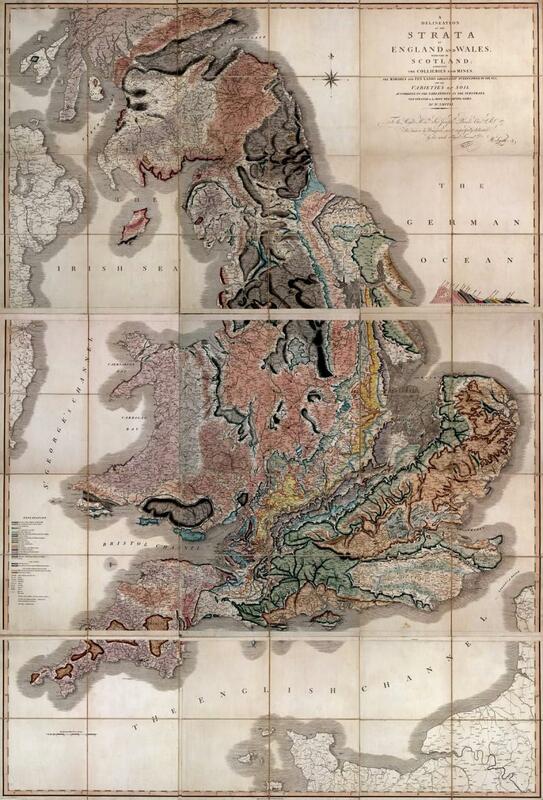 Geologic map of Britain made by William Smith in the year 1815. These maps were made from careful observations and notes on rock types and fossil assemblages in the field. It is noteworthy that many of these geologic correlations and maps were made well before Darwin's concepts of natural selection and biological evolution were published (image from Wikipedia). The development of the science of geology is an interesting study, but is beyond the scope of this site. For a good reference on this, I would defer you to Davis Young's 2008 book, "The Bible, Rocks and Time." For now, it will suffice to say that serious academic study of the earth and its processes has been ongoing over the last four centuries. Early on, geologists would place their observations into the biblical accounts of Creation and the Flood while adhering to a Young-Earth time scale of only 6,000 years. Later on in the 18th and early 19th centuries, some geologists began noticing that there was significant evidence that the earth was potentially much older. There appeared to be much evidence against all the fossil-bearing strata being laid down in a year-long global Flood as well (examples of similar evidence is given on the Flood Geology Challenges page). They began to notice that the rock strata could be correlated based on its fossil content and lithology (rock type), and that these correlations could be made over large areas. Based on these correlations and some basic principles, such as Superposition (that the rocks on the bottom are older than the rocks on top) and Original Horizontality (that the rocks were not originally deposited at any angle, but generally flat), they were able to start a geologic time scale of the earth. It is very important to note that these observations, correlations, and the development of the geologic time scale all began and were fairly well established before 1859 when Charles Darwin wrote his "Origin of Species" book outlining the concepts of natural selection and biological evolution. It is therefore an inescapable fact that deep time (millions and billions of years) and biological evolution are two independent concepts. There is ABSOLUTELY NO REASON to link the idea of "millions of years" with evolution. This is a common misconception that I hope to debunk on this site. 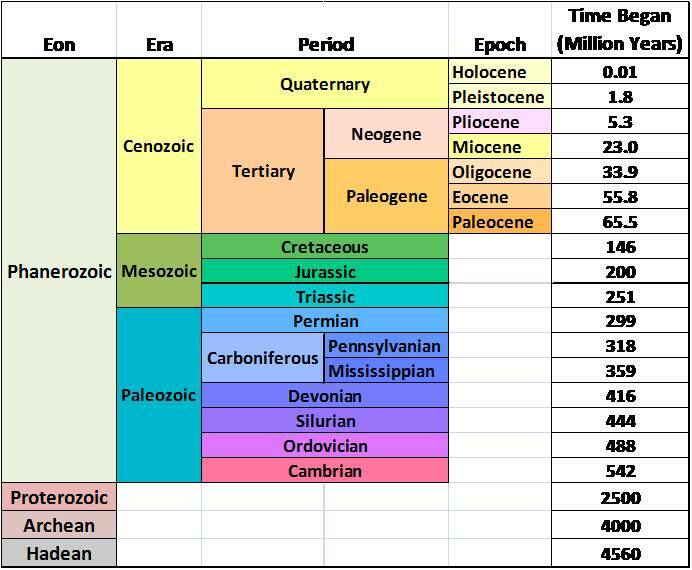 Geologic time chart showing the time periods in earth history. The rocks deposited in these periods can be correlated with confidence from one place to another, sometimes over great distances based on their rock type, characteristics, and fossil assemblages. When done correctly according to the scientific method, geology will lead one to the truth about how the earth works and what processes were at work in the past to shape the earth as we see it today. While we cannot be certain about the events of earth history, the rocks themselves bear witness that many of the processes we see today have indeed happened at times in the past. Careful study of rock outcrops often reveals similar characteristics to those we find in modern environments of deposition such as river systems, beaches, deserts, coral reefs, deep marine settings, etc... Some of these characteristics include sediment type, grain size, grain sorting, mineralogy, bed morphology and fossil assemblages. It is just these types of observations and comparisons that lead geologists to their interpretations of earth history. And it is just these types of observations that have led geologists to the successful discovery of billions of barrels of oil in some of the remotest places on the planet and buried miles beneath the surface. If the geologic record did not display this kind of order and predictability, geoscientists in the oil industry would not be nearly as successful as they are. Also, it would be impossible to construct a geologic column or time chart if the rock record was chaotic and had no degree of repeatability or correlation. As it is, the geologic column is a tremendously valuable tool with which a geologist can correlate rock units from one location to another with a good deal of confidence. Any model of earth history therefore must account for this order and consistency. It has been said before that there is nowhere on earth where this entire geologic column exists. This is simply not true. Rocks representing every period on the time chart above are found in many basins around the world. One example is the Ghadames Basin in Libya where pre-Cambrian metamorphic rocks underlie the complete succession. The misconception that the geologic column is only found in textbooks comes from a misunderstanding of geology and the processes that have acted in earth's past. Before one can truly assess the geologic evidence, a basic understanding of the science is necessary. Please see the Geology page on this site (COMING SOON) or www.geology.com for fundamental geologic information and concepts. It is not necessary to have an advanced degree in geology in order to understand how observations of the earth, both presently and in the rock record, affect the model for earth history. If the earth is young, say on the order of thousands of years, then the evidence of our observations should clearly point to that conclusion. Conversely, if the earth is much older, possibly billions of years, then the evidence should clearly point in that direction. As stated above, if the God of the Bible created the heavens and the earth as in Genesis 1:1, then the study of God's Word and God's Creation should result in the same interpretation. The two sources should not contradict, but rather compliment. Please keep this in mind as you read through the pages on this site. I recommend going through them in the order given to the right. If you have any questions or comments about anything on this site, or a question about geology or the Bible, please feel free to Contact me anytime.